Beware: “Tools change culture” may sound like wisdom, but it’s not. It’s a fallacy often repeated by people who want cover to embark on a tools project without addressing what is really wrong with their organization. and a few tech-worshippers got upset, e.g. Really disappointing to see some prominent "DevOps" people reject the need for tooling repeatedly. There is far more to IT than information or technology. The information and technology are useless dead lumps without the people and process and business and partner and service and value and governance aspects of IT to bring them to life. I first said it back in 2006: technology does not fix process. If the process is broken technology is not going to fix it. Bang your head hard against the desk while repeating five times "technology is not going to fix it". If your people do not have a service management culture; if your service management processes are not well designed, bedded in to the organisation, and measured and monitored; if you do not have this situation then all the cool tools in the world are not going to fix it dammit! ... if you have a process problem there is not a technology solution. A few years later I talked about over-hyping Cloud. This is yet another example of that old IT pestilence: one "thing" as the answer to a complex question. Tech alone solves nothing. We are talking in the context of organisations not society as a whole. Don't confuse your personal digital experience. 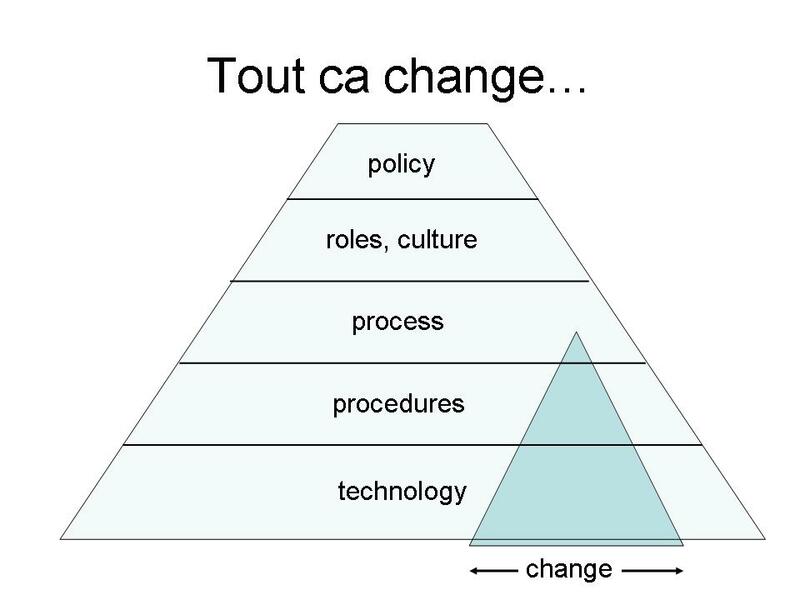 A few exceptional technologies impact culture in step-changes. That's not something you can generalise to every software tool, though the vendors sure try. Organisations do not wish to change in the organic uncontrolled manner that society does. Org change is directed. By changing people not tools. Good people can work with crap practices. They soon fix them. Good practices can work with crap tools. They show what needs fixing. It doesn't work the other way. Good tools don't fix crap practices and they sure as hell don't make good people and culture. Or looked at conversely: tech change is only a small part of the overall change. Tech makes change more efficient and effective. Occasionally it is essential to the change. Coming soon: "Tech is the easy bit".